“Having been in your position in various projects over the years, I feel compelled to offer my own advice–born from experience–on your push to “complete” the boat: get her complete first. 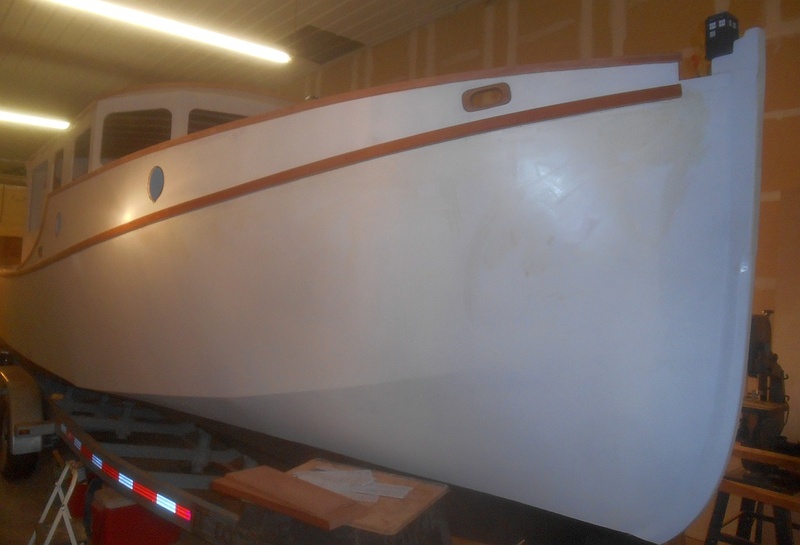 Pushing for an artificial schedule, with no real goal other than some intangible need to get her launched before she’s really ready will hurt you in the long run, and frankly you would be better off to simply continue working through the summer, fall, and winter and get the boat complete for a logical spring launch when she’s actually ready to be launched. 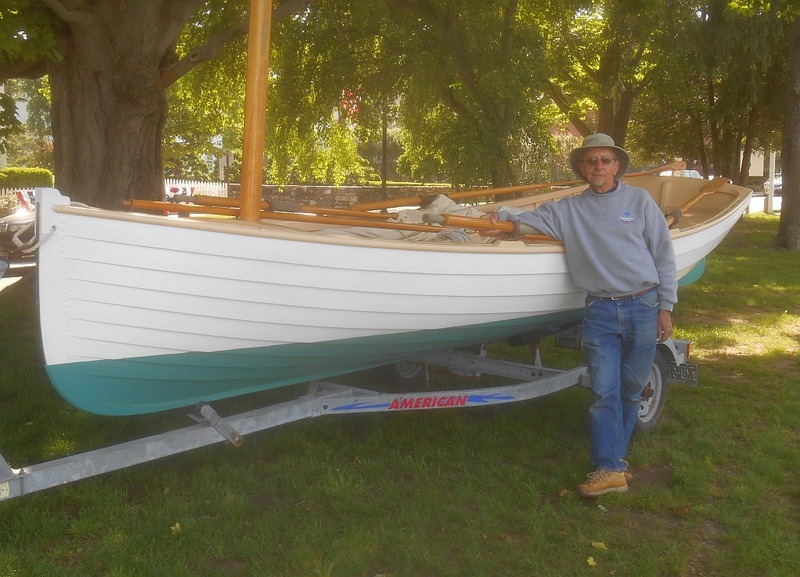 — Two volunteers have done a tremendous amount of work for the Connecticut River Museum on the 1885 shad boat Alva Starr and the steam launch Osprey. I felt compelled to help them through the final phases and have been working about half days on Tardis and half days on CRM projects. 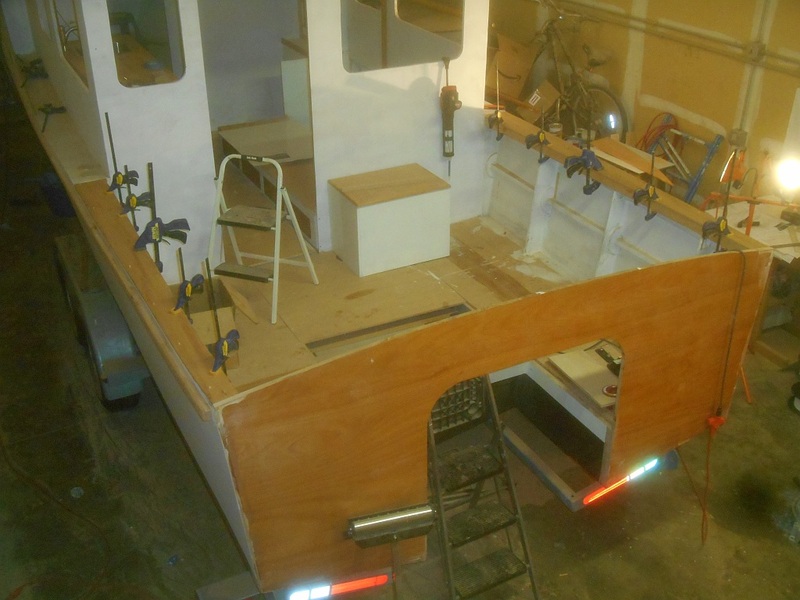 — The Boatbuilding Workshop is coming up and with a new design to be built, I need to see that through. 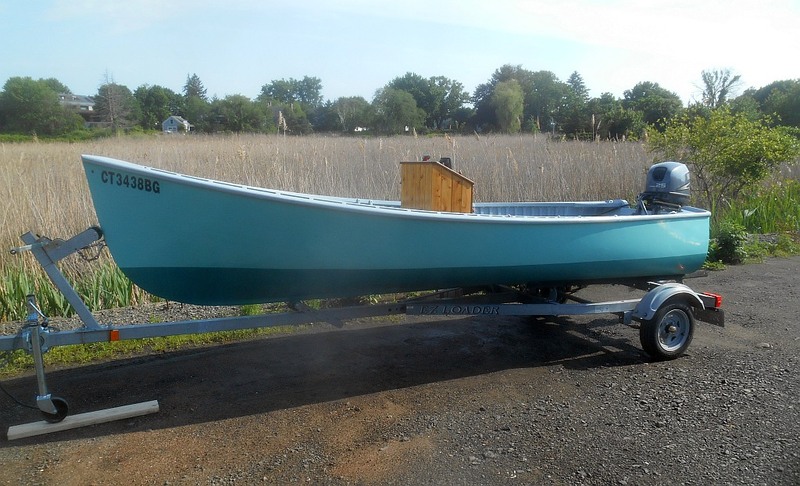 — I had to get my Jericho Bay Lobster Skiff ready to go with new paint top and bottom. So many procedures on the Tardis are sequential: 1) I wasn’t going to trim out the cockpit, but to launch the boat, I need heavily reinforced cockpit side decks for the aft cleats. So on they went. 2) The battery charger has safety shield that means you want to run the wires once and never take them apart. They AC and DC wires really need to go in together, so that part of the plan doesn’t make sense. 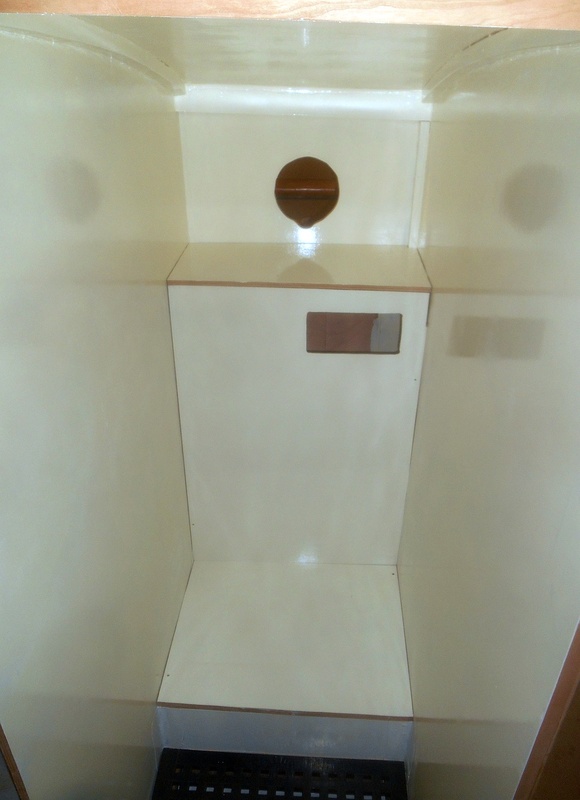 3) The window manufacturer suggests installation after paint completion. 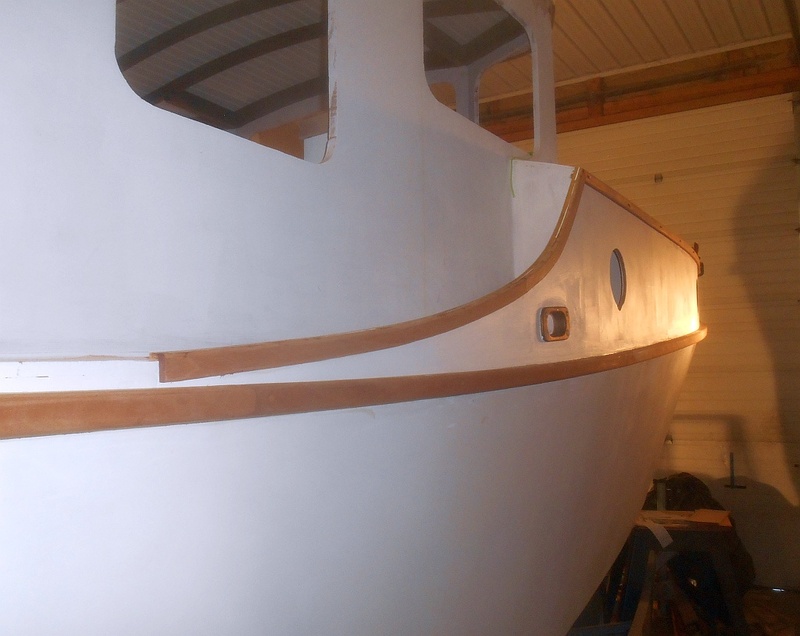 So I am on the ladder painting away months ahead of the boat seeing sunlight. And so on. So it seems I will be forced kicking and screaming to have a normal, relaxing summer after all. Tardis will be done when she’s done. — The cockpit side decks went on. — Some major pieces of exterior trim went on. The pictures just don’t show how the horizontal mahogany pieces lengthen the lines of the boat in a really striking way. 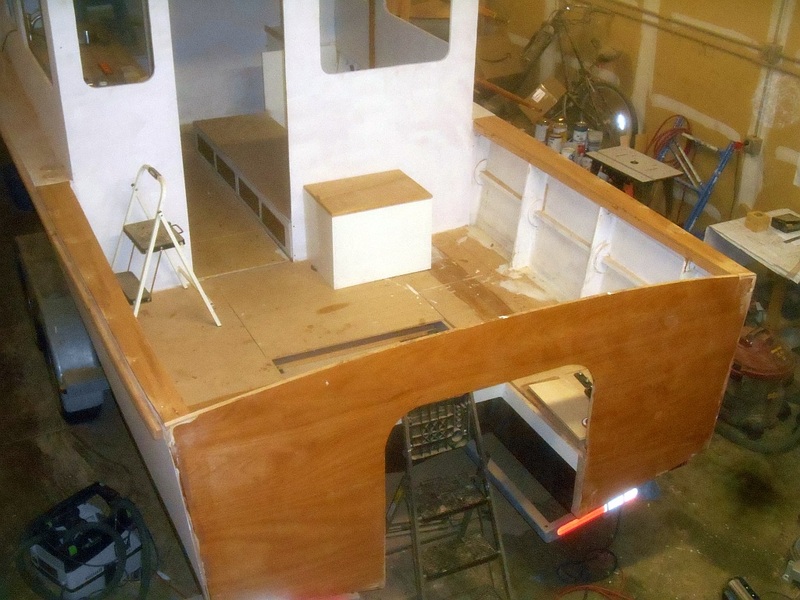 — The head is all painted out, a lengthy process since as a “wet” area I am treating it exactly the same as the hull: epoxy barrier coat, regular primer, two coats of gloss hull paint for easy cleaning. Forecabin trim — these curved pieces aren’t easy!